The insurrection in the erstwhile Naga Hills district of Assam, which later became the state of Nagaland in 1963, is the oldest in the Indian sub-continent and goes back all the way to 1947. In 1997 the Centre began talks with insurgents and made conscious attempts to bring about lasting peace. But, the expansion of the Naga insurgency - Manipur, Arunachal Pradesh and Assam - has made things trickier for Delhi. The idea of a separate Naga homeland surfaced just before India's Independence. The Naga Nationalist Council (NNC) led by A Z Phizo, an Angami Naga from the Khonoma village of what is now Nagaland state, had then appealed to the Indian National Congress not to include their lands in the formation of the Indian Union. When their demand was rejected, the Nagas were the first to revolt against Delhi. The NNC declared independence (of 'Nagaland') on August 14, 1947. The Indian army was sent to the Naga Hills to crush the insurgency. Thus, began the armed conflict, which ultimately cost over 10,000 lives. Phizo went ahead and created an underground government called the Federal Government of Nagaland (FGN) in March 1956. As the situation turned serious, the Parliament enacted the Armed Forces (Special Powers) Act, 1958, to empower the army to deal with such armed rebellion. In a bid to garner international support, Phizo escaped to the then East Pakistan in December 1956. Later, he reached London in 1960 and stayed there still his death in 1990. Along with the massive army crackdown, the Centre also began its negotiation with the representatives of various Naga tribes. This led to the signing of a 16-point agreement in 1960 between the Centre and the leaders of Naga People's Convention (NPC) whereby formation of Nagaland as a full-fledged state within India was agreed. In 1972, the Centre banned the NNC and FGN. A massive counter-insurgency operation was then launched by army and para-military forces compelling the 'moderate' rebels to sit on the negotiating table. The infamous Shillong Accord was signed on November 11, 1975 between the Centre and a section of the NNC and FGN where the rebels accepted the Indian constitution. The hardliners in NNC, though, rejected the Shillong Accord and formed the National Socialist Council of Nagaland (NSCN) in 1980. It revived the insurgency and was led by Isak Chishi Swu, a Sema Naga, Thuingaleng Muivah, a Tangkhul Naga from Manipur and S S Khaplang, a Hemi Naga from Myanmar. Tribal affinity is important for Nagas and divisions on tribal lines are so deep rooted that the NSCN suffered a vertical split in 1988 with Isak and Muivah on one side and Khaplang on the other. Over 100 Naga rebels died fighting in 1988 during the split inside the jungles of Upper Myanmar. However, both the groups still work for "Nagalim" or " Greater Nagaland", which comprises all the contiguous Naga inhabited areas of the North-East. The Isak-Muivah faction has called themselves as National Socialist Council of Nagalim. Popularly known as NSCN (IM), this faction slowly become the most powerful Naga rebel group. The Centre succeeded in signing a ceasefire agreement with the NSCN (IM) in August 1997 and began peace talks. The Khaplang faction retained its original nomenclature, National Socialist Council of Nagaland, but is now known as NSCN (K). In April 2001 it also signed a ceasefire agreement with the Centre. 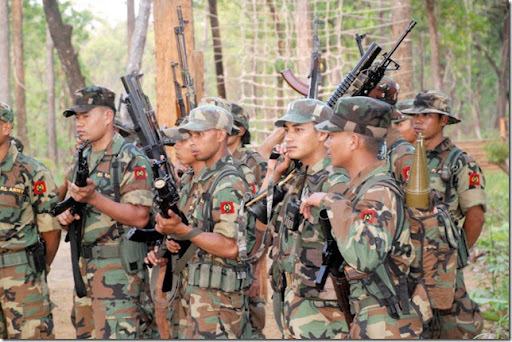 Later, a new outfit called NSCN (Khole-Kitovi) has also emerged as another force. Fratricidal killings among Naga insurgents is unabated. Yet, in the years since 1997, peace has returned to Nagaland and the people have realised the futility of violence. Besides the widespread opposition to the NSCN (IM)'s demand for a 'Greater Nagaland', the Centre is also currently finding it tough to frame an agreeable formula among Naga rebel factions.